Written by C. Raja Mohan. Large states always have problems with their peripheral regions. Resolving the tension between the centralizing imperatives of the state based in the heartland and the logic of autonomy and trans-border connections in the frontier regions has never been easy. All great empires in the subcontinent based in the Gangetic plain, including the Mauryan, Mogul and the British Raj, have faced difficulty absorbing and controlling their frontier regions. The Raj, the strongest of these formations, had devised a complex three-fold frontier system that included a loosely integrated tribal belt beyond the areas of administered sovereignty and third layer of protectorates and buffer states. Managing the North West frontier was a special challenge for all the empires. As the main route for land invasions, the north western marches have always demanded the devotion of considerable diplomatic, political and military energies from the imperial centre. The strongest of the three empires, the British Raj, was obsessed with the North West frontier and engaged in rather costly wars to control the region and prevent aggression from European rivals, including France, Germany and Russia at different periods of time. India’s own preoccupation with the north western marches endured the partition and decolonization of the subcontinent. Despite the resurgence of China and the disputes that emerged over the Indo-Tibetan frontier in the North, it is the North West that has endlessly bothered Delhi. Three and a half wars and perennial tensions with Pakistan has sucked much of the strategic bandwidth of successive governments in Delhi. The scale of the challenge posed by Pakistan and its profound interconnection with India’s internal political dynamic has made it one of the most intractable problems in the world since the Second World War. Since the end of the Cold War and the nuclearization of the subcontinent, the problem has morphed to become even more intense and complex. All our prime ministers, despite belonging to different political hues, have since then tried different ways to resolve the problems with Pakistan and build a normal relationship. On the face of it, Prime Minister Narendra Modi is no exception. Yet, in the two and a half years since he took charge as the PM, it can be argued that his principal objective is to restructure India’s engagement with Pakistan in fundamental ways. The most compelling reflection of that has been the decision to order army raids across the Line of Control in Kashmir at the end of September as a response to the attacks on an Indian military facility a couple of weeks earlier. Many greeted it as a long overdue step to challenge Pakistan’s support to cross-border terrorism in India. Others saw the cross-LoC attacks on terror launch pads as a dangerous move that could intensify the current conflict with Pakistan. Yet others criticized it as another of the flip-flops that have so far characterized Modi’s Pakistan policy. Sudden and frequent reversals have been very much part of India’s engagement with Pakistan over the last three decades. Leaders of different political colours have struggled to negotiate peace with Pakistan, more so after nuclear weapons and cross-border terrorism cast a shadow over bilateral relations since the late 1980s. Modi’s predecessors – from Rajiv Gandhi to Manmohan Singh – oscillated between engagement in hope, disengagement in despair and confrontation in anger. All leaders believed that their personal sincerity could help end the stalemate with Pakistan. All had to eventually settle down to a pattern of dialogue frequently interrupted by terror and military confrontation. Breakthroughs occasionally seemed close at hand, but always remained elusive. Modi’s tenure has followed a similar pattern. Prime Minister Modi began with great flourish in inviting Pakistan Prime Minister Nawaz Sharif for the inauguration of his government in May 2014. In August 2014, he suspended talks citing the unacceptability of Pakistan’s talks with Kashmiri separatists. He even raised the ante with a massive and sustained artillery barrage for a few months. Then through 2015, he explored prospects for a resumption of the dialogue with Pakistan, even reaffirming a determination to normalize relations by dropping by in Lahore on short notice at the end of 2015. The attacks on the Pathankot air force station a week later and the Uri brigade headquarters in September, however, saw the PM move in the other direction. A review of Modi’s multiple moves suggests the familiar picture of no war, no peace. It also reveals a bolder approach that has sought to break from the past. It has tended to be more muscular within the constraints imposed by the ground situation. It also has been far less predictable. Five major elements characterize Modi’s effort to change India’s strategy towards Pakistan. First is a willingness to take risks. Unlike his predecessor, Manmohan Singh, Modi has been willing to make bold moves in seeking peace or facing unto war. To his credit, Singh too had come close to agreements on ending the disputes over Siachen glacier and Sir Creek with Pakistan. Even more important, Singh had initiated an apparently productive negotiation on Kashmir with Musharraf through an authorized back channel. In his last press conference in early 2014, before his second tenure as PM came to an end, Singh suggested that a historic agreement with Pakistan on Kashmir was quite close. Yet, the tragedy of Singh’s decade-long reign was that he could not sign off on any one of them. Despite many appeals from the Pakistan Army Chief, General Pervez Musharraf, Singh could not bestir himself to visit the neighbouring nation even once during his decade-long tenure as the PM. There was much too much resistance from the national security bureaucracy to Singh’s Pakistan initiatives. The Congress party leadership too was reluctant to embark on any radical steps – either for peace or war – towards Pakistan. Modi’s bias is quite clearly in the opposite direction. He is willing to test conventional taboos relating to the peace process with Pakistan and ready to take risks in favour of both war and peace – ready to escalate military confrontation and also demonstrate the political will to make unconventional peace moves. Second, Modi has brought a fresh perspective to the negotiating framework with Pakistan. The collapse of the old economic order at home, the very different international environment after the breakdown of the Soviet Union, internal pressures arising from the turmoil in the Kashmir Valley and Pakistan’s new-found levers inside India pushed Delhi into a corner at the turn of the 1990s. A deeply defensive India in the 1990s conceded, if reluctantly, that negotiations with Pakistan were necessary to resolve the impasse in Kashmir. If P.V. Narasimha Rao played for time and finessed the problems, the governments of Deve Gowda and I.K. Gujral (1996-98) seemed to have no option but to put Kashmir back on the negotiating table with Pakistan. The Shimla Agreement of 1972, Delhi believed, had brought the negotiations on Kashmir to a close and all that remained was to formalize the settlement by turning the Line of Control into an international border. The Pakistan Army, however, saw the Shimla Agreement as an imposition on Pakistan after the loss of Bangladesh in 1971. It also convinced itself that nuclear weapons had altered the balance of power in the subcontinent and that it could reopen the Kashmir question. In January 2004, after a series of military crises, Vajpayee negotiated the terms of a peace process with Pervez Musharraf that called for a resolution of the Kashmir dispute in a violence-free atmosphere. Prime Minister Manmohan Singh ran with this baton and came close to resolving the disputes in Siachen and Sir Creek, negotiated an agreement on Kashmir, expanded economic engagement and people to people contact during 2004-07. Musharraf’s decline and fall during 2007-08, his successor Gen Ashfaq Kayani’s reluctance to confirm the agreements reached under Musharraf, and the 26/11 terror attack on Mumbai dealt a body blow to the peace process. The attempts to revive the peace process during UPA 2 made some progress, for example an agreed road map on normalizing trade relations, but could not be consummated. Modi had come to office with the confidence that he could alter the terms of engagement through creative diplomacy with Nawaz Sharif, mounting pressure on the Pakistan Army and expanding his party’s influence in Kashmir. Modi’s attempts met a number of stumbling blocks; the explosion of violence in the Kashmir valley during the summer and fall of 2016 may well have convinced Delhi about the poor prospects for productive engagement with Pakistan, particularly in the near term. Unlike his predecessors, Modi has put greater emphasis on the question of terror in the engagement with Pakistan, insisting that Pakistan must address India’s concerns on terror as a priority in any potential peace process. Modi’s predecessors, albeit reluctantly, accepted that they had no choice but to live with Pakistan’s support for terror. Modi, in contrast, is betting that he can call Pakistan’s bluff by escalating the conflict. Crossing the Line of Control was one element of Modi’s strategy to put pressure on the Pakistan Army to end its support for cross-border terrorism. That brings us to the third dimension of Narendra Modi’s Pakistan policy – to rethink the conventional wisdom on the ‘sanctity of the Line of Control’. Although Pakistan has continuously destabilized the parts of Kashmir under India’s control since the late 1980s, Delhi insisted on the immutability of the LoC. Modi has now ended that one-sided respect for LoC by putting Pakistan Occupied Kashmir and Gilgit-Baltistan into the political contestation with Islamabad. Whether merely a bargaining tactic to force Pakistan to settle along the LoC or not, Modi has opened the possibility for rethinking India’s approach to the Kashmir conflict. After the cross-LoC raid at the end of September, Delhi affirmed that it was a one time operation and that it was willing to work with Pakistan to counter terrorism in the region. At the same time, Modi’s advisers have hinted that if Pakistan continues with its cross-border terrorism, Delhi will let its army cross the LoC in retaliation. If terrorism continues in Kashmir, it is possible to imagine that the LoC will no longer be a thin military line of separation, but a zone of protracted conflict. In pondering the idea of expanding the LoC into a zone of conflict, Modi is willing to look beyond the holy cow of the Shimla Agreement. Fourth, Modi has clearly broken ranks from his predecessors in demonstrating the will for the ‘horizontal escalation’ of the conflict. The tradition has been to view the conflict with Pakistan within a narrow framework that focused on two core issues – cross-border terrorism for Delhi and Kashmir for Islamabad. But by raising the question of Balochistan, Modi is now willing to go where no one in Delhi was willing to consider after India’s support for the separation of East Pakistan in 1971. In fact, the Indian emphasis in recent decades has been on ending the tragedy of map making, insisting instead on settling territorial disputes with Pakistan on the basis of status quo. Though India’s statements of support have been carefully limited to political references to human rights violations by the Pakistan Army, these have the potential to create trouble for Islamabad in unprecedented ways. This, of course, invites the risk of Pakistan doing the same – of meddling in India’s internal troubles beyond Kashmir. Modi, however, appears to be betting that in such a game of destabilization he can do more damage to Pakistan and that this in turn might act as a deterrent. Under Modi, India’s horizontal escalation is not limited to Balochistan. Modi has also seized on the opportunity to deepen strategic collaboration with Afghanistan. If the previous governments in Delhi limited the nature of their relationship with Kabul to avoid provoking Rawalpindi, Modi is willing to take his chances. In stepping up defence cooperation with Kabul and working with it to put pressure on the Pakistan Army, Modi has lent a new dimension to India’s geopolitics in the North West. The Afghan President Ashraf Ghani’s failed peace initiative towards Pakistan has made him an unlikely partner for Modi. Cross-border destabilization has been an existential threat to Afghanistan. Ghani, therefore, has both echoed Modi’s concerns about Pakistan’s cross-border terrorism and joined Delhi in withdrawing from the SAARC summit in Islamabad at the end of November 2016. Although the Pakistanis have often complained about India-Afghanistan strategic cooperation and the two front dynamic that it could produce, Delhi has generally avoided getting drawn into the conflict between Kabul and Rawalpindi. It had put greater priority on normalizing ties with Pakistan rather than confronting Islamabad through greater collaboration with Kabul. Modi, in contrast, is willing to explore those possibilities. Fifth, the boldest part of Modi’s new approach has not been horizontal escalation, but in the more demanding vertical dimension. The cross-LoC attacks by the army demonstrate the will to escalate the conflict with Pakistan into a full-blown military confrontation, including its nuclear dimension. To be sure, India in the past had occasionally sought to escalate the confrontation vertically, as it did during 2001-02, following the terror attack on the Indian Parliament. India’s full military mobilization, Operation Parakram, put pressure on the United States to compel Pakistan’s then Chief of Army Staff General Pervez Musharraf to formally commit Rawalpindi to end support for anti-India terror groups. The confrontation did lead to a period of reduced cross-border violence and a productive moment in the peace process. A ceasefire all along the frontiers of India and Pakistan held for a while after it was unveiled at the end of 2003. There were purposeful negotiations on Kashmir, and an expansion of trade and popular contact. That period came to an end in November 2008 with the terror attacks on Mumbai. Amidst the resurgence of cross-border violence, Delhi struggled to come up with a strategy to stop the Pakistan Army from organizing these attacks or nurturing groups hostile to India. Modi has now taken the first step to break out of that box. Underlying all this is the bet that Delhi can afford to escalate the confrontation vertically. Many in India and the world have cautioned against the costs of such escalation. Modi, however, has a good appetite for risk. Unlike the Congress party, which played safe on both war and peace with Pakistan, Modi has taken a series of risks with Pakistan. Many view his latest gamble of courting escalation in the confrontation with Pakistan as reckless, but it is not without some calculation. That India is much better placed in the world today than it was in the 1990s gives Modi greater confidence that he can manage the diplomatic fallout from an escalation. As one of the fast growing economies with significantly improved relations with the great powers, Delhi now has less reason than before to fear that the world will breathe down its neck in the event of a confrontation with Pakistan. Meanwhile, the world’s patience with Pakistan’s support for terror has worn thin. After the failures in Iraq and Afghanistan, there is little enthusiasm in the US and the West for fixing the world’s problems. Thanks to George Bush and Barack Obama, Washington has learnt to control its Kashmir itch. It has also been reluctant to push India into a policy of unconditional engagement with Pakistan. 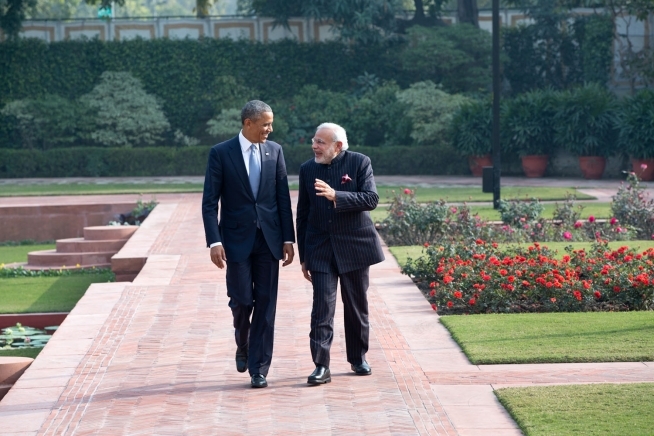 Washington’s counter-terror cooperation with Delhi has steadily expanded. Washington is also more eager to engage with Delhi on the future of Afghanistan. Pakistan’s supporters in the Muslim world too are deeply divided today and focused on their own internal and regional conflicts. Saudi Arabia and the United Arab Emirates, for long solid allies of Pakistan, are less inhibited in their security cooperation with India and unwilling to inject themselves on behalf of Islamabad in Pakistan’s disputes with India. China has been an important exception to this trend. Beijing appears to have ended its apparent neutrality in the contestation between Delhi and Islamabad. Although the world has been muted in its response to India’s cross-LoC attacks in Pakistan, Modi is surely aware that it will not be easy to persuade the Pakistan Army to end its support to cross-border terrorism in India, especially in Kashmir. Modi has kept the door open for a dialogue with Pakistan by refusing to gloat over the cross-border attacks and in maintaining a measure of nuanced differentiation between the Pakistan Army and its civilian leadership. Pakistan PM Nawaz Sharif’s refusal to grant a second term to the Army Chief, General Raheel Shareef, in November 2016 has been widely interpreted as a major success for civilian leadership in Islamabad over Rawalpindi, where the army headquarters are located. This might open the door just a wee bit for renewed diplomacy between Delhi and Islamabad for a resumption of the bilateral dialogue. Cynics in Delhi, however, would argue that one swallow does not a summer make. They see little possibility for a change in Pakistan’s orientation towards India in the near term. If there is no perceptible reduction in cross-border violence and there are major terror attacks, Modi will be called upon to act with even greater intensity than the cross-border raids at the end of September 2016. Anything less will be seen as Indian weakness and reveal Delhi’s vulnerabilities in all their nakedness. But while Modi can raise the level of violence, he can’t simply let the conflict escalate beyond a point. Maintaining effective control, therefore, over the pace, direction and scope of the confrontation with Pakistan will be quite demanding. Developing a strategy for proportional military responses to cross-border terror attacks in Kashmir will be hard. Preventing the Pakistan Army from rallying the nation under its banner against India is a key objective for Modi. But that is complicated by jingoism whipped up by social media and the danger of politicizing the conflict with Pakistan. Yet, there is no denying that Modi’s stronger political standing at home and changed international circumstances have given him some room to explore ways out of the prolonged deadlock with Pakistan. Whether he succeeds or not, the dynamic between the two countries that has evolved over the last quarter of a century may not necessarily survive the tenure of Modi in Delhi. C. Raja Mohan is the Director of Carnegie India and is a leading expert on South Asian security, great-power relations in Asia, and arms control. This article was republished with the permission of the author and Carnegie India and can be found here. Image credit: CC by Narendra Modi/Flickr.